Finally the Infinity Playing Cards are here! Infinity encompasses everything by enclosing everything to infinity! Therefore the name Infinity was chosen for the deck. On the backs of the cards - as well as on the joker - two parrots are depicted as they emerge from black holes; these birds symbolize the sky, while the earth is the branch on which they rest. And the sky and earth indicate the whole present in the universe. 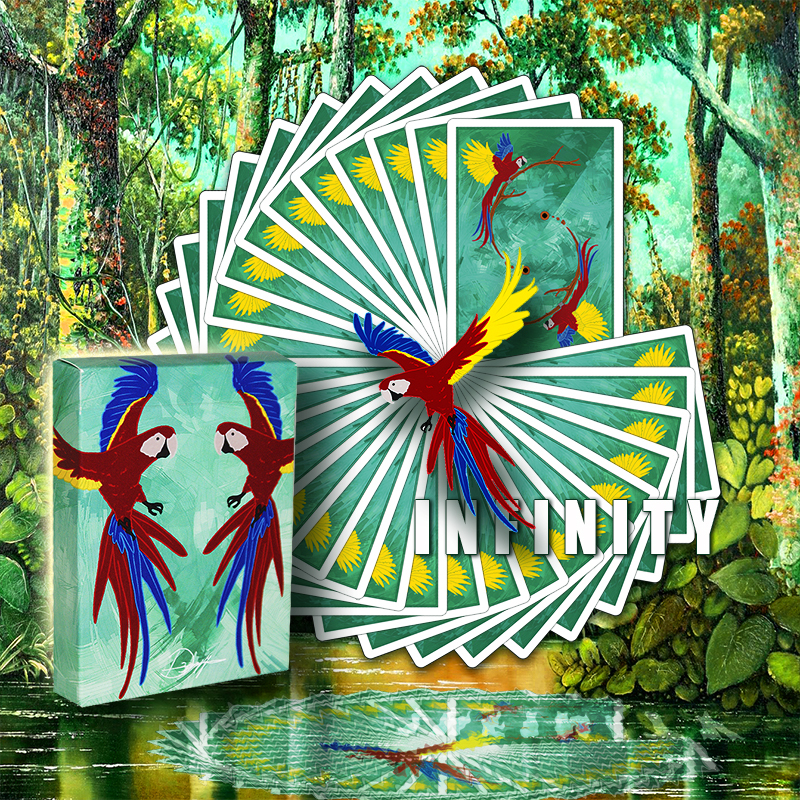 Infinity is a deck of cards suitable for both magic and cardistry. The cards, due to the crushed stock that is used, seem less than they actually are and this makes them handle fantastically. The beautifully crafted deck was produced by the USPCC, so you can already imagine its great quality. All kings and jacks have been modified and customized ... try to recognize them! The design of the deck was made almost entirely by hand. The deck is enriched by some special cards: 1 gimmick card - 1 duplicate of the queen of hearts - 1 normal joker and 1 gimmick joker. The tutorial of the possible effects with the gimmick cards will be available, soon, on the YouTube channel "D3psy". "I thank Vincenzo Di Fatta infinitely who helped me to make this project that started over than 1 year ago come to life, and thank my graphic designer Marco Fracassini who had the patience to make the art work by hand, and finally I want to thank all my friends who supported me throughout the making of the deck "- D3psy • The cards are poker size.